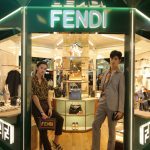 Global Travel Media » Blog Archive » Fendi Kiosk Travels to Siam Paragon! 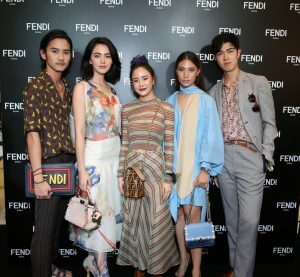 Fendi Kiosk Travels to Siam Paragon! 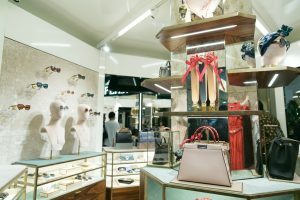 FENDI opens a brand new store as pop-up store in Siam Paragon, right in the heart of the main shopping area in Thailand. The pop-up store concept, the FENDI KIOSK, is a luxurious reinterpretation of the Roman style vintage newsstands that you will find in a typical Piazza in the heart of Rome. There are two FENDI Kiosks at Siam Paragon, one dedicated to the Spring/Summer2018 Women’s show collection, and the other one is dedicated to the Spring/Summer 2018 Men’s show collection. Both FENDI Kiosks feature ready-to-wear, leathergoods, small leather goods, accessories and shoes. To celebrate the launch of the pop-up store, FENDI has thrown a roman inspired cocktail party on the 16th of March 2018. Special guests including Mai Davika, Note Panayangkool, Violette Wautier, Sonya Singha, Nattarat Nopparuttayaporn, Chontida Asavahame, Pasakorn Vanasirikul and Sorawis Saengvanich have joined in the celebration of the pop-up store. The two FENDI Kiosk travelling pop-up stores in the Atrium of Siam Paragon will feature the Women’s and Men’s Spring Summer 2018 Collection. The Women’s SS18 Collection focuses on the Tropical Futurism Theme, with the iconic FF Logos which can be seen throughout the collection, from Leather Goods, Small Leather Goods, Shoes and Accessories. The adorable Space Monkeys and Banana charms make an appearance at the Kiosk as well. The Men’s SS18 collection feature Everyday FENDI Items. These pieces feature illustrations done by British artist, Sue Tilley. From a glossy red corkscrew to an antique set of keys, leaky bathroom taps, a plastic rotary telephone, desk lamp, banana peel, Tilley’s focus zooms in on the banality of everyday life – not glorifying but simply reflecting on these universal domestic motifs with a vibrant, spontaneous hand. The FENDI Kiosk will be open from today to June 2018.